While there’s no denying the power of classroom lectures, discussions and activities, learning doesn’t stop when students leave Whitman’s well-appointed halls of academia. In fact, for many Whitties, class is just the starting point of an exhilarating journey through the world of the liberal arts. Armed with knowledge and ideas shared by the esteemed faculty, students set out to rigorously explore their curriculum in places as diverse as the subjects they study. To catch a glimpse of these scholarly sanctuaries, we asked students to lead us to the locations, activities and opportunities that inspire their inquisitive minds. Whether perched on a sturdy tree branch, huddled around a table at Penrose Library, tucked away in a bustling downtown coffeehouse or gathered around the bonfire of a moonlit campsite, Whitman students are proving that the world is their classroom. "In the shower. Not that I can bring any books with me or get any paperwork done. But the white noise-type environment allows my thoughts to flow easily, so that I can elaborate on conclusions that I have learned and deepen my understanding on certain topics." "Personally, any moment when I have contact with people can be a most intense learning moment, because English is not my first language, and I have so many things to learn from people around me." Alumni: Where did you learn? Students featured here have each found their own creative and productive ways to learn and study. What was your favorite setting to learn and study when you were a Whitman student? Share it with us by e-mailing Lana Brown, editor, at brownll@whitman.edu or mail a note to Lana’s attention at 345 Boyer Ave., Walla Walla, WA 99362. Do you have a picture of you studying/learning in your favorite place? Send it, too. See how alumni studied and learned through the years in the March 2011 issue of Whitman Magazine. "On the basketball court I learned to focus on the present." "I learn through my involvement in on-campus clubs. I learn about myself, other people and about everything I have the potential of doing." "I am on the debate team. I learn the most, more than anywhere else, when at debate." "I learn in bed. No really! It’s a great and quiet place to read and study. It helps me get away from the rabble of campus and the business of my housemates. I just have to make sure that I’m sitting up the whole time, or else I tend to fall asleep. On that note, I can’t memorize anything unless I have at least one night to sleep on it, so in that case, I sometimes learn the best when I am asleep. I need a quiet place to let my reading sink in, and it is often when I am alone and have time and energy to devote to my reading that I become most critical of it. I find myself having a discussion with the source through my notes in the margins." "In the dance studio, we stack the ballet barres along the back wall of the room, four barres deep. This creates a little ’cave’ that I like to slide underneath and bring a book and a highlighter. At perfect moments in the day, between dance classes, the sunlight streams through the window and hits the black, marley (dance) floor — warming it up so that I stay warm in my little cave." "I learn when I explore new places and try new things. One of the greatest tools of learning is looking at concepts from multiple perspectives." "I learn in the classroom and the library. During lectures I am like a sponge, soaking up the information. Then I go to the library to study and do homework to reinforce the concepts I learned in class. The library and classrooms both provide atmospheres where I am able to focus and build on what I learn by asking the professor questions, studying with a group or looking something up in a book." "Places I learn: Cross country races; studying at breakfast; in my bed." "The staircase of Lyman House is my secret study place, where many paper topics have been realized and math problems solved. It is relatively secluded and enables me to pick the brains of those who pass by." "I learn in the geomorphology lab room in the geology wing of the Hall of Science (first floor). As a first-year student, I tried studying in the library — the designated study place on campus — but I quickly figured out that studying in the library (generally) is like reading The New York Times on your laptop at Starbucks. It’s the show of learning; it’s the place to be seen — literally. The library is so open, people are constantly coming up to catch up and say ’Hi.’ The geomorphology lab room, however, is quiet, without distractions, and uncomfortable enough with its flame-retardant lab desks and hard-back chairs, that I only go there when I’m serious. I go in, shut the door half-way, and get to work. I use the chalkboard to diagram chemistry problems and to clarify my thought processes." "My best learning moments came from my summer theater internship in my hometown of Olympia, where I directed a group of 5-, 6- and 7-year-olds in a short play. While teaching them how to express themselves through theater, I re-learned many important life lessons myself!" "My best learning occurs in the moments when I’m trying not to learn. I often find myself taking a break from reading about Robert Merton’s manifest and latent functions or tearing my hair out over Peter Singer’s utilitarianism to pick up one of the books inevitably left on the tables in the library. I suppose there are reasons why students don’t reshelve or return library books they used, but thanks to certain students’ laziness, I flip through one of these books and discover something new. While sometimes the books on the table reflect my interests and academic discipline, often they do not, and this is the joy of learning in unexpected places. Whether Renaissance art history, political economy or developmental psychology, I uncover information that sparks a new interest, answers a lingering question or sometimes does neither of those. At any rate, I’ve learned that oftentimes the knowledge gained in unexpected places is the most rewarding." "I learn in my music classes, both piano and chorale. Musicians have to discipline themselves, and when I let myself sink into the music, I find that I gain knowledge of the music as well as about myself. It awakens my mind." 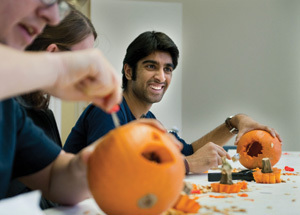 Al-Rahim Merali ’13 carves pumpkins with other student academic advisers (SAs) as part of a staff health activity. “Our task was to carve a pumpkin that was representative of our past week,” Merali said. Student academic advisers live in first-year student residence hall sections and serve as an academic resource. "Being an SA (student academic adviser) has challenged me and assisted in my growth, both socially and academically. From this experience, I have gained a better understanding of what it means to be balanced and live a healthy life. This opportunity has helped me develop a skill set that enables me to interact with, understand and assist others in their personal growth. I have become more confident in my abilities to time-manage, problem-solve and effectively mentor others. Having had the opportunity to enhance the lives of others has been truly fulfilling, and it is one that I am very thankful for." "I certainly learn best/most when talking with professors informally in small groups or one-on-one. It’s an extremely relaxed atmosphere, and there’s no pressure or anxiety. However, the best place for me to study would have to be the science building atrium." Nicole James ’11 studies in the Hall of Science atrium. Editor’s note: While students who participated in this feature focused their attention on learning experiences on or near campus, about 50 percent of Whitman students study abroad during their junior year, and many other students learn through off-campus programs or Whitman courses taught overseas. For more information, visit the Off-Campus Studies website.